Revive your sense and surrender to the tranquil ritual of diffusing fragrance. The white onyx vessel helps to purify negative energy all while you enjoy the perfect aroma for your mood. Take control of the strength of your diffuser by adding the exact dose of scented oil to fit your daily needs. Suggested start with applying 20 drops of scented oil. 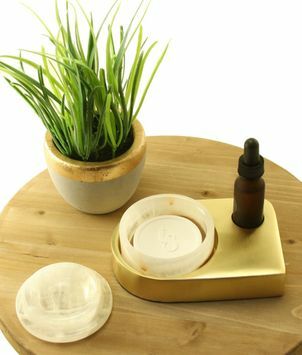 When fragrance is not desired, simply cover the white onyx vessel with the matching onyx lid. All of these unique pieces can be displayed on the handcrafted brass plated stand.